Dungarvan Shopping Centre wants to give one lucky customer €200 every week for the next 10 weeks by paying for your shopping at Dungarvan Shopping Centre! All you need to do is fill out the entry form in participating units and pop it into the entry box on the mall. 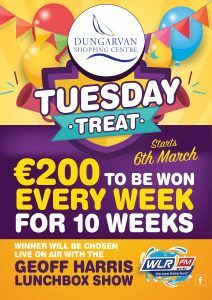 The Tuesday Treat will give 10 different customers a chance to win a fantastic prize of €200 worth of Dungarvan Shopping Centre vouchers all courtesy of Dungarvan Shopping Centre. Every Tuesday for the next 10 weeks one lucky customer will be picked out live on air with WLRfm Lunch Box show and claim the prize of €200 worth of Dungarvan Shopping Centre vouchers to spend as you wish. Dungarvan Shopping Centre is delighted to launch this unique giveaway as our way of saying thank you for your support as we near our 15th year in business since the doors opened at Dungarvan Shopping Centre. 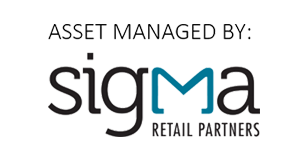 Entry forms will be available in participating units on the mall in Dungarvan Shopping Centre so let us put the cask back in your pocket and make your money go further all courtesy of Dungarvan Shopping Centre where we have all you need under one roof.